By Britt Gillette 1 Comment - The content of this website often contains affiliate links and I may be compensated if you buy through those links (at no cost to you!). Learn more about how we make money. Last edited November 18, 2017 . 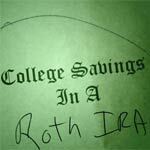 Can you use your Roth IRA to pay for higher education expenses? Yes. Under IRS rules, you can withdraw funds from your Roth IRA early and avoid the 10% early withdrawal penalty if you're using the funds to pay for qualified education expenses. 3) Those expenses must be for an eligible member of your family. If you need to pay for education expenses which meet these criteria, then more than likely, you're eligible to make an early, penalty-free withdrawal from your Roth IRA. First, it's important to remember that you can always withdraw your original Roth IRA contributions tax-free and penalty-free at any time and for any reason. Only your Roth IRA earnings (such as interest, dividends, and capital gains) trigger taxes and penalties if you withdraw them early. So what constitutes an early withdrawal? Any withdrawal of earnings which is made prior to meeting the Roth IRA 5 year rule and prior to reaching age 59 ½. For instance, let's say you're 40 years old with $20,000 in your Roth IRA. Your $20,000 balance is composed of $14,000 in original contributions and $6,000 in capital gains. 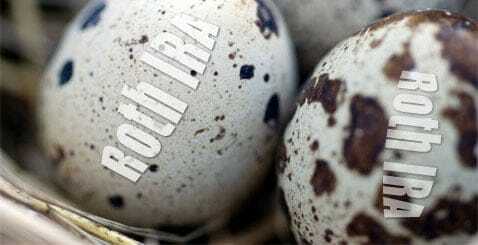 Under the Roth IRA withdrawal rules, you can withdraw up to $14,000 tax-free and penalty-free. But if you withdraw the remaining $6,000 in capital gains, that $6,000 is subject to income taxes and a 10% early withdrawal penalty. So if you need to withdraw funds from your Roth IRA to pay for educational expenses, then you would first withdraw any original contributions you've made – which are withdrawn tax-free and penalty-free. But if you need to make an early withdrawal of earnings from your Roth IRA, you can avoid the 10% penalty (but not the income taxes) if you use the funds to pay for qualified higher education expenses at an eligible educational institution for an eligible family member. Room and board only counts as a qualified higher education expense for special needs students who are enrolled as at least half-time students. For instance, if your daughter is attending college, her tuition counts as a qualified higher education expense. So does the cost of her books, enrollment fees, and the laptop computer she's required to have. But her rent and utilities at a local apartment complex don't count. Once you identify your qualified higher education expenses, you need to make sure they're incurred at an eligible educational institution. So what consitutes an “eligible educational institution”? This is the easiest to meet of the three criteria. Most postsecondary educational institutions meet this definition, from your local community college and state university to online, for-profit university programs. But if you're not sure, just ask. Your school will know the answer. Once you establish that you have a qualified higher education expense incurred at an eligible educational institution, then you only need to make sure the expense is paid on behalf of either yourself or an eligible family member. So who are eligible family members? Brothers, sisters, and second cousins don't qualify. Only the direct descendants of either yourself or your spouse. So do all qualified higher education expenses incurred at an eligible education instition on behalf of an eligible family member avoid the 10% penalty if you make an early withdrawal from your Roth IRA? Unfortunately, no. If you've already paid the bill for your qualified higher education expenses, and you're looking to make an early withdrawal in order to reimburse yourself, you may not qualify. That's a lot of fine print to take in, so let's use an example to illustrate. Let's say you're 45 years old, you're in the 25% tax bracket, and you have $36,000 in your Roth IRA – $14,000 in original contributions and $22,000 in capital gains. Your 19 year old son just finished his sophomore year in college incurring qualified higher education expenses of $18,000. He received a $2,000 tax-free scholarship, while you paid the rest of his tuition and book expenses for a grand total of $16,000 in out-of-pocket expenses. You can use your Roth IRA to reimburse yourself for these out-of-pocket expenses. In fact, you can withdraw up to $14,000 tax-free and penalty-free. Why? Because in doing so, you're simply withdrawing your original after-tax Roth IRA contributions. However, the next $2,000 you withdraw is subject to income taxes, but NOT the 10% early withdrawal penalty. Why? Given your age, a withdrawal of earnings consitutes an early withdrawal, so it's subject to income taxes at your current rate of 25%. However, because you're using the funds to pay for qualified higher education expenses, you avoid having to pay the 10% early withdrawal penalty. If you try to withdraw an additional $2,000 for a grand total of $18,000, you'll owe income taxes AND the 10% early withdrawal penalty. Why? Even though $2,000 was used to pay for qualified higher education expenses, those expenses were already covered in the form of a $2,000 tax-free scholarship. So any additional funds beyond the $16,000 you've already withdrawn from your Roth IRA will be treated the same as any other non-qualified early withdrawal. And non-qualified early withdrawals are subject to income taxes and a 10% early withdrawal penalty. If you or a qualified family member incur qualified higher education expenses, you can use your Roth IRA savings as college savings to pay for those expenses and avoid the 10% early withdrawal penalty if applicable. While a Roth IRA is primarily intended as a vehicle for retirement savings, each individual circumstance is different. As such, you might want to look into using this special IRS provision to help out with your higher education expenses. My company offers matching on 401k’s, is there anything comparable for that?